Dr. Desai's Martian Atmosphere Model Challenge and Loss of the Schiaparelli Lander. Entry, Descent &Landing/Parachutes Issues Examined (Updated at Figure 2B on December 7, 2017). Updated Statement of December 7, 2017 by Barry S. Roffman to the Thales-Alenia Space -Italy Group responsible for the entry and descent of ExoMars 2016. I see you continue to access this article frequently, and that the Finnish Meteorological Institute (FMI) who invented the Vaisala pressure transducer used on Phoenix, MSL and sent on ExoMars 2016 accessed this article today via IP address 193.166.223.5 at 07/Dec/2017:02:59:23 MST7MDT). Before getting into our detailed evaluation of the loss of the Schiaparelli Mars lander, please allow me to draw from aspects of ESA's Exomars 2016 - Schiaparelli Anomaly Inquiry dated May 18, 2017. On July 21, 2017 my article was first updated with my initial impressions in the blue fonts below, a new Table 1, and an updated Figure 1. Today, December 7, 2017, most of my changes are based around a new Figure 2B - published after FMI read this the article early this morning. With respect to this branch of the failure tree, it has to be noted that hypersonic parachute deployment is a very complex and dynamic phenomenon affected by several uncertainties (winds, wake, etc.) and therefore very difficult to predict (and model). a. Atmospheric dispersion (density/temperature) NOTE: Also see Figure 2B for proof that exceessive Mars air density forced ESA to raise the orbit of the ExoMars orbiter and http://blogs.esa.int/rocketscience/2017/10/19/exomars-successful-flux-reduction-manoeuvre/. Of course, with respect to atmospheric density, as you well know, we argue for air pressure at areoid that is about 85 times higher than NASA asserts. As for wind/gusts, if NASA was right about a low atmospheric density and pressure, winds aloft would likely be insufficient to cause the loss of the lander. You are likely right about correcting the problem with the IMU. Perhaps that will be enough to overcome the density problem, but we challenge the wisdom of your statement that ExoMars 2020 will proceed with models of Atmosphere and Winds as per 2016. The rest of what we have below will be updated as appropriate based on our continuing detailed analysis of your Inquiry. Dr. Desai assumed that because four landers in a row landed downrange on Mars, the atmospheric density profile must be less than predicted. But his assumption and request for help was made before the ExoMars 2016 crash on October 19, 2016. On October 26, 2016 E&T Engineering and Technology wrote that, "the engineers believe the lander’s on-board computer somehow concluded that the probe was already nearing the surface while it was still at an altitude of more than 2 km (note: the actual altitude was 3.7 km). As a result, the lander ditched its parachute too early and fired its braking rocket engines for only 4 seconds (actually 3 seconds) instead of the planned 29." We will show that would be consistent with a denser atmosphere than expected which is exactly what the Roffman MarsCorrect Team has been arguing for eight years now. 1.1. Updated Summary of European Space Agency (ESA) Crash Investigation Statement of November 23, 2016 and details provided in the Exomars 2016 - Schiaparelli Anomaly Inquiry dated May 18, 2017. Paragraphs 1.1.1 to 1.1.3 are from the 2016 statement. Paragraphs 1.2.1 to 1.2.3 are from the 2017 Inquiry. 1.1.1. The parachute deployed normally at an altitude of 12 km and a speed of 1,730 km/h. The vehicle’s heatshield, having served its purpose, was released at an altitude of 7.8 km. 1.1.2. As Schiaparelli descended under its parachute, its radar Doppler altimeter functioned correctly and the measurements were included in the guidance, navigation and control system. However, saturation – maximum measurement – of the Inertial Measurement Unit (IMU) had occurred shortly after the parachute deployment. The IMU measures the rotation rates of the vehicle. Its output was generally as predicted except for this event, which persisted for about one second – longer than would be expected. 1.1.3. When merged into the navigation system, the erroneous information generated an estimated altitude that was negative – that is, below ground level. This in turn successively triggered a premature release of the parachute and the backshell, a brief firing of the braking thrusters and finally activation of the on-ground systems as if Schiaparelli had already landed. In reality, the vehicle was still at an altitude of around 3.7 km. 1.2.1. When we compare what was predicted by ESA before the anomaly with what they concluded in 2017, our case for higher than advertised Martian air pressure gets stronger. But before going into the details, let's look at expected events times during the Entry Descent and Landing (EDL) with actual times. They are summarized on Table 1 and Figure 1A. IMU measures pitch rate greater than expected. IMU raises a saturation flag. 1.2 Our Initial Comments and explanation of terms. We believe that the IMU saturation flag and Guidance Navigation and Control (GNC) estimated attitude error of about 165 degrees of the Entry Demonstrator Module (EDM) is 100% in line with our research showing that Martian air pressure is far higher than advertised. The extra air density at altitude was the cause of the inertial measurement unit's confusion. The expected surface air pressure was reached far before the surface. What is an Inertial Measurement Unit (IMU)? An IMU is an electronic device that measures and reports a body's specific force, angular rate, and sometimes the magnetic field surrounding the body, using a combination of accelerometers and gyroscopes, sometimes also magnetometers. Specific force is defined as the non-gravitational force per unit mass. Specific force (also called g-force and mass-specific force) is measured in meters/second²(m·s−2) which are the units for acceleration. Thus, specific force is not actually a force, but a type of acceleration. The g-force acceleration is the same as the specific force. The acceleration of an object free falling towards the earth depends on the reference frame (it disappears in the free-fall frame, also called the inertial frame), but any g-force "acceleration" will be present in all frames. This specific force is zero for freely-falling objects, since gravity acting alone does not produce g-forces or specific forces. Accelerometers on the surface of the Earth measure a constant 9.8 m/s2 even when they are not accelerating (that is, when they do not undergo coordinate acceleration). For Mars the figure is 3.711 m/s2. Accelerometers measure specific force (proper acceleration), which is the acceleration relative to free-fall, not the "standard" acceleration that is relative to a coordinate system. There is a question as to whether altitudes given by ESA refer to MOLA altitude or height above the ground. The landing site was 1.2 km below Mars areoid (the equivalent of sea level). When ESA says that lander fell from a height of 3.7 km, we assume they mean is 2.5 km above areoid down to 1.2 km below areoid, however the tables below allow us to discuss what the significance would be if ESA forgot to factor in which heights are relevant. Table 2 shows that if the accepted NASA pressure of 6.1 mbar at areoid is correct, then the pressure at 3.7 km would be about 4.33 mbar. Table 3 show that if the 3.7 km height refers to above ground level then 3.7 km above that at 2.5 km above aeroid we would expect pressure to be down to about 4.85 mbar. The difference of 4.85 mbar to 4.33 mbar (0.52 mbar) is not enough to cause a problem that would result in an early parachute jettison. But Table 4 shows that if pressure at areoid is 12 mbar then pressure at 3.7 km above aeroid would be down to about 8.52 mbar. In this case pressure at 11 km above aeroid is about 4.33 mbar, which is what we saw on Table 2 for 3.7 km above areoid. So if a parachute were deploy, as planned, at 11 km then the Inertial Measurement Unit could have caused the lander to react as if it was too low. The report given by ESA is that the parachute deployed at 12 km. If that's true and of the pressure at areoid should really be 12 mbar, then the expected pressure 6.1 mbar pressure at areoid would in fact have been reached at 7.3 km above areoid. If the 12 km parachute deploy altitude is with respect to height above ground level, meaning 10.8 km above aeroid, pressure at deployment would have been, on average, around 4.41 mbar, but the 6.1 mbar figure would have been at 7.3 + 1.2 = 8.5 km above the landing site. If there is 12 mbar at areoid, then expected pressure 1.2 km lower would be about 13.41 mbar, and the expected pressure of 6.8 mbar at the landing site based on 6.1 mbar at areoid would, in fact, have been reached about 6.11 km above aeroid, or (6.11+1.2) about 7.31 km above the lander. TABLE 2 - PRESSURES BASED ON A FALL FROM 3.7 KM ABOVE AREOID TO AREOID. TABLE 3 - PRESSURES BASED ON A FALL FROM 3.7 KM ABOVE GROUND (2.5 KM ABOVE AEROID) TO 1.2 KM BELOW AREOID. TABLE 4 - PRESSURES BASED ON 12 MBAR AT AREOID. Because of the error in the estimated attitude that occurred at parachute inflation, the GNC Software projected the RDA range measurements with an erroneous off-vertical angle and deduced a negative altitude (cosines of angles > 90 degrees are negative). There was no check on board of the plausibility of this altitude calculation (which should have shown that it was impossible to go from an altitude of 3.7 km to a negative altitude in one second). i) Consequently the “consistency check” failed for more than 5 sec. after which the RDA was forced anyway into the loop based on the logic that landing was impossible without the RDA. The correctness of the other contributor to the altitude estimation, i.e. the attitude estimate, was not put in question. The RDA was put in the loop (event signaled by RIL time-out flag at 14:46:46). - The GNC mode entered was TERMINAL DESCENT where the altitude is scrutinized to release the Back-Shell and parachute if the altitude is below an on board calculated limit. FIGURE 1 ABOVE: Planned ending to the landing for Exomars 2016, the landing ellipse, and the crash site. Based on targeted and final coordinates it looks like the crash was 13.1 km downrange of the target. FIGURE 2A ABOVE - The insert on the upper left is misleading as the actual landing for Phoenix occurred after parachute separation and terminal descent thruster firing. The rest of Figure 2A is devoted to photos of the Phoenix descending to Mars. When the 2.65m diameter Phoenix lander is shown with its parachute, the parachute diameter appears to be well under 10m, but certainly not as large as 11.882m. Figure 2B ABOVE - Consistent with findings on what caused the Schiaparelli lander to crash, the ExoMars 2016 orbiter was forced to raise its orbit due to excessive density of Mars' atmosphere. 2. SIZE OF PARACHUTES USED ON MARS. Obviously, a parachute could not be used to slow a rocket landing on the Moon. There would be no air for the parachute to catch. One would think that the low atmospheric pressures on Mars would require an enormous parachute to land there. The actual landers on Mars cut the parachutes loose before landing, going to retrorockets or air bags, but the parachutes used are actually not very large. In fact, the one used for Phoenix was reduced to 39 feet (see Figure 2A upper left Idaho test insert below) from the 42 feet used for Pathfinder. However, the rest of Figure 2A appears to show a considerably smaller parachute that Wikipedia describes as having an apparent diameter of only 10 meters (~33 feet). What would happen in terms of the parachute if the air was less dense than planned for by the NASA EDL team? If less dense all the way down, the parachute would be less effective, and the probe would come in faster and possibly crash. However, we have seen above that Desai admits the density is higher down low when it is lower up high. Somehow the normal scale height ratios are not holding on Mars, but this begs the question of why they do not hold? Are there radical alterations of density profiles that are causing probes to land long or crash? If the atmosphere was more dense than planned for down low, the parachute would work, but the probe would take longer to reach the surface, perhaps drifting for more time in the Martian winds. It would land long, as was the case with Pathfinder, Spirit, Opportunity, and Phoenix. 2.1 PROBLEMS IN IDENTIFYING PARACHUTE SIZE. 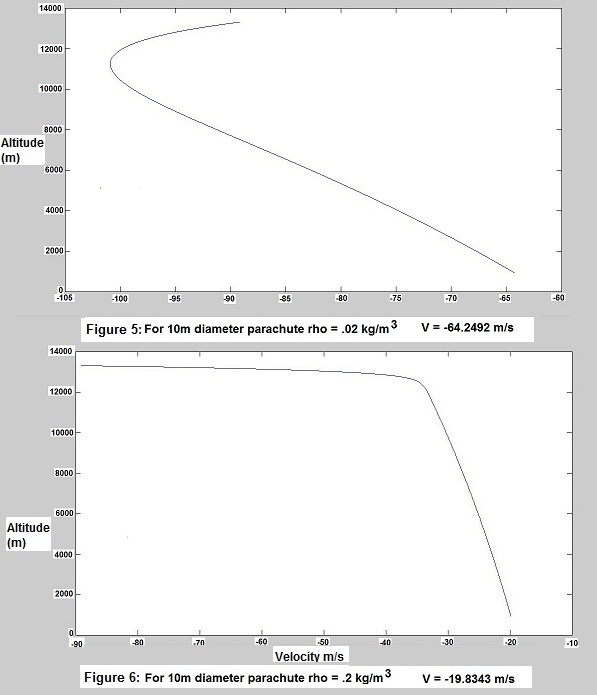 If there seems to be some confusion about which parachute diameter to use for Phoenix calculations, consider the article entitled Mars Exploration Entry, Descent and Landing Challenges by Dr. Robert D. Braun of the Georgia Institute of Technology and Robert M. Manning of the Jet Propulsion Laboratory at the California Institute of Technology. Table 1 of their 2005 paper lists the (planned) diameter of the Phoenix DGB (Disk-Gap-Band) Parachute as 11.5 meters (37.73 feet). The same table lists the DGB parachute diameter of the Viking 1 and Viking 2 as 16 m, but on Figure 12 the diameter shown is only 11.7 m. For Mars Pathfinder Table 1 lists the DGB parachute diameter as 12.5 m, but Figure 12 shows its diameter as 7.9 m. Table 1 further lists the DGB parachute diameter for Mars Exploration Rovers A (Spirit) and B (Opportunity) as 14 m, but Figure 12 shows just 8.9m. It looks like the different diameters may be due to differences in how the diameters are measured. Probably the larger figures represent the diameter of the 2D parachute when spread out on the floor, while the smaller diameters represents the size seen when the edges are pulled in due to the attached suspension lines, riser and payload and below the canopy and skirt. The Braun and Manning paper indicates that all parachutes used for Mars landings including that planned for the Mars Science Lab were flight tested only in the 1960s. Due to great expense, these tests were not ever repeated.There is a link to a video of one such test of a 40-foot (12.192 m) parachute here. Testing a model of the parachute that will slow the Schiaparelli Entry, descent and landing Demonstrator Module (EDM) as it plummets through the Martian atmosphere. When the module is about 11 km from the surface, descending at a speed of about 1700 km/h, the parachute will be deployed by a mortar. Trailing behind the module at a distance of 27 m, the parachute will slow the module to about 200 km/h (at 1.2 km from the surface), at which stage the parachute will be jettisoned. The canopy, with a nominal diameter of 12 m, is made from nylon fabric and the lines are made from Kevlar, a very strong synthetic material. Tests of how the parachute will inflate at high (supersonic) speeds were carried out in a supersonic wind tunnel in the NASA Glenn Research Center. It was not immediately clear from the above if the command to jettison comes from the radar that is supposed to come on at an altitude of 7 km (and a speed of 320 km/hour), or whether the command is due to a pressure measurement. But, again, from ESA's press release on 11/26/2016 we learned, "saturation – maximum measurement – of the Inertial Measurement Unit (IMU) had occurred shortly after the parachute deployment. The IMU measures the rotation rates of the vehicle... When merged into the navigation system, the erroneous information generated an estimated altitude that was negative – that is, below ground level. This in turn successively triggered a premature release of the parachute and the backshell, a brief firing of the braking thrusters and finally activation of the on-ground systems as if Schiaparelli had already landed." So, as was indicated above, it would appear that a design flaw was to place more reliance on the IMU than on the radar (and, of course, to place more reliance on NASA's bogus pressure data than on why we concluded that that it is fatally flawed because it utterly fails to explain the Martian weather plainly seen). BBC initially reported that, "Schiaparelli also was programmed to do some science work during its brief descent through the planet's atmosphere — for example, measuring air density, pressure and temperature from an altitude of 81 miles (130 km) down to the planet's surface," ESA officials said. So it seems plausible that the pressure sensor could have been tied into the parachute jettison mechanism. More, the radar woud not turn on until the craft was supposed to be down to 11 km. The belief that it would have arrived at 11 km would have to have been programmed in based on assumptions that were derived from earlier NASA Mars landers. If the radar came on too early because of a denser than expected atmosphere, then an issue arises as to how much fuel was available to the thrusters which were supposed to kick on at an altitude of only 1.1 km and a speed at 250 kph (155.343 mph). If the margin of safety on the fuel was insufficient to keep the engines on long enough then a crash would have been unavoidable. Tables 2A and 2B explain what we mean. Table 5 assumes a 6.1 mb pressure at areoid on Mars. If this were true then at 11 km above aeroid (when the parachute was expected to to deploy (assuming that ExoMars was targeting a place at areoid) using a scale height of 10.8 the expected pressure would down to about 2.2 mb. If the 11 km figure refers to 11 km above the ground, and the intended landing site was 1.2 km below areoid, then working up from there the 9.8 km altitude should have a pressure of about 2.46 mb. However, stratus clouds have been seen 16 km above Mars Pathfnder. Pathfinder sits at 3.682 km below areoid, therefore the clouds were at 12.318 km above areoid. if stratus clouds form on Mars under conditions like those on Earth, then it should be noted that on Earth stratus clouds form up to an altitude of 13 km above sea level. There the pressure would be about 163.33 mb. If the same pressure was the minimum pressure required for stratus clouds needed on Mars it would imply a pressure at areoid of 510.98 mb. With this pressure, at 11 mb above areoid the pressure would be 184 mb - so high that it would guarantee not only early, but probably immedate jettison of the parachute and ignition of the thrusters - but way too late. If the 11 km altitude refers to above a ground level of -1.2 km, then the pressure at 9.8 km above areoid would be 208.5 mb. ESA trusted the NASA assertions. There are surely modifications that we will make to this article, possibly including the EDL codes written at the end of this article. But if ESA wants to get landings on Mars right it needs to plan on bringing us or at least our findings about Martian weather and atmospheric pressure into the process. The fact that the Inquiry report on May 18, 2017 mentions the air density and wind questions is encouraging. VIKING 1 -3.637 10.8 -0.327657658 -0.720609673 -1.387713818 1.387713818 8.465054288 Actual VL-1 Year 1 minimum pressure was 7.29 mbar, maximum pressure was 10.72 mbar, average of these two was 8.04 mbar (94.978 of expected value). PHOENIX -4.126 10.8 -0.382037037 -0.682469776 -1.465266353 1.465266353 8.938124755 Phoenix did not operate on Mars for anywhere near a Martian year. MARS SCIENCE LAB -4.4 10.8 -0.4074074 -0.665373057 -1.5029163 1.50291628 9.167789309 Actual MSL Year 1 and 2 minimum pressure was 7.32 mbar, maximum pressure was 9.25 mbar both years but we document numerous data alterations. Average of these two (identical) sets of pressures was 8.295 mbar which is only 90.4798% of the 9.167789 mbar predicted. -1.2 10.8 -0.111111111 -0.894839317 -1.117519069 1.117519069 6.816866319 Opportunity's Anticipated Pressure in mbar. ExoMars 2016 targeted same area/altitude. 11 10.8 1.018518519 -2.769089369 -0.361129551 0.361129551 2.20289026 Expected ExoMars 2.2 mbar pressure when parachute deploys at 11 km. -9.8 10.8 0.907404407 -2.477890039 -0.40346159 0.403569159 2.461771872 Expected pressure @ 11 km Above 1.2 km Below Areoid. Note: While a flm about an alleged joint U.S./Soviet unmannd landing on Mars in 1962 is widely understood to be a hoax, the film gives the pressure at the purported landing site to be 707.3 mbar. Is this a coincidence? See https://www.youtube.com/watch?v=CsVqa2xaBeQ. MEAN AREOID 0 10.8 0 -1 -1 1 510 Areoid pressure based on stratus clouds at 13 km. 11 10.8 1.018518519 -2.769089369 -0.361129551 0.361129551 184.1760709 Pressure at 11 km where parachute would deploy! 12.318 10.8 1.140555556 -3.128505941 -0.319641394 0.319641394 163.0171109 Stratus clouds at 12.318 km over areid (Mars Pathfinder). The parachute system design is driven by the limited altitude between where the probe decelerates to a Mach number compatible with parachute deployment (Mach below 2.1 and a maximum dynamic pressure of 910Pa) and the surface – as little as 5 km. 3. ALTERNATE PRESSURES ON MARS. It turns out we had these miniature pumps. We call them wide range pumps but they’re really turbo-molecular pumps on top of the molecular dray stage. The really nice thing about these pumps is they exhaust naturally right at Mars pressure, 10 millibar, 7 millibar. Um, and it turns out there is a very slow leak, uh, into the Tunable Laser Spectrometer and so there was just a little bit of a residual atmosphere in the harriot cell which is the cell where the light bounces back and forth to get a long path length for the methane, the carbon dioxide and the water measurements and so the tens of millibars that we had in there, I think we had 51 millibar and we had assumed that the pump would be fine evacuating that, we routinely evacuate Mars ambient out of the cell but it was just high enough the current sensor on the pump said, nah this is a little bit too high I‘m gonna turn myself off and it did but SAM continued merrily along its measuring path assuming that we had not turned off and so we measured that gas with both the mass spectrometer and the Tunable Laser Spectrometer. It really led to some excitement. The TLS (Tunable Laser Spectrometer) Team, Chris and Greg, their eyes were wide open. They saw all this methane, and it turns out it's terrestrial methane, but it was kind of a good test…. The 51 mbar mentioned by Dr. Mahaffy should not be overlooked. That might be a clue about how high Martian pressure really is. On Earth that pressure would equate to an altitude of about 63,057 feet or 19,220 meters. Mahaffy, in his statement above shot down the detection of methane on Mars, but later NASA reversed itself. If 51 mb is the pressure at MSL (4.4m below areiod), then the pressure at areoid would be about 33.94 mb, and the 9.1 mb (910 Pa) would be at about 14.216 km. Mariner 69's occultation experiment indicated that the atmospheric pressure at the surface of Mars ranged from 4 to 20 millibars, rather than 80 millibars as estimated earlier. This information had a definite impact on the aerodynamic shape of the Mars entry vehicle being designed, since weight and diameter would influence the craft’s braking ability. Langley engineers had determined that aerodynamic braking was the only practical method for slowing down a lander as large as Viking for a soft touchdown. The entry vehicle would have a diameter of 3.5 meters, an acceptable ballistic coefficient that would help ensure Viking's safe landing on Mars. It appears that by Mariner 69's, the article is referring to the Mariner 6 and 7 flyby spacecraft that had their closest approaches to Mars on July 31, 1969 and August 5, 1969. But their NASA-advertised radio occultation pressures for Mars were only 3.8 to 7.0 mbar. The 20 mbar figure is almost 3 times higher. And what are we to make about the 80 mbar figure that is refuted with the 20 mbar estimate? Mariner 4 had flown by Mars on July 14, 1965. Its estimate of pressure on Mars was pegged at 4.1 to 7 mbar on their website located at http://nssdc.gsfc.nasa.gov/planetary/mars/mariner.html, though as mentioned earlier in Section 5, Kliore had it pegged at 4.5 to 9. If NASA had the 20 mbar figure, and was publishing it too, the question must be asked, why in the world would it select pressure transducers for the Vikings that could only measure up to 18 mbar and why was a transducer that maxed out at 11.50 mbar chosen for MSL? Figure 40 (at http://davidaroffman.com/images/correct_40_history.png) shows there were pressure estimates of 20 mbar in 1965 (Evans), but after Mariner 6 and 7 the issue was supposed to be settled with a maximum pressure at 9 mbar (less than the 10.72 mbar measured by Viking 2). The 20 mbar at areoid figure is extrapolated to other altitudes on Table 9 below. If pressure at areoid is really the NASA-advertised 6.1 mbar, then at 3.7 km when the parachute jettisoned early the expected pressure would have been about 4.33 mbar. However if the earlier NASA 20 mbar areoid figure is correct then ExoMars 2016 would have encountered a pressure of about 14.199 mbar (or, if the 3.7 km figure refers to above ground level [1.2 km below areoid] then the pressure would have been 15.87 mbar - see Table 11. On July 13, 2017 I received an e-mail from Nathan Mariels of Global Electric Technology in Oakland, in California. He provided some eye-opening links about the true pressure ranges on MSL. In looking at them it became apparent that the Vaisala pressure sensor inventors at the Finnish Meteorological Institute have been playing games with the public, publishing different ranges at different times. The sensor might not max out at 11.5 mbar (1,150 Pa). REMS shall measure the Ambient Pressure in the range of 1 to 1150Pa with a resolution of 0.5 Pa and accuracy of 10 Pa BOL and 20 Pa EOL. Requirement 012 (PLD-20), REMS shall measure the Ambient Pressure at a minimum sampling rate of 1 Hz for at least 5 minutes each hour continuously over the mission. The pressure device measurement range is 0 - 1025 hPa in temperature range of -45°C - 55°C, but its calibration is optimized for the Martian pressure range of 4 - 12 hPa. Note: 1025 hPa = 1,025 mbar! So, while it was supposedly optized for 4 to 12 (not 11.5) mbar, it was still capable of measuring up to 1,025 mbar. Again, average pressure on Earth at sea level is 1,013.25 mbar. This is, to borrow a phrase from the Wizard of Oz, a horse of a different color. There are two orders of magnitude difference between the range stated in the REMS calibration Plan and that identified by the FMI at the American Geophysical Union. Frankly, this is large enough to allow for one (wrong) set of data to be given to the public while NASA maintains a secret ability to measure the real pressure is which is Earth-like. More, since the emphasis has been on the low (wrong) pressure sensor range it seems likely that this issue has great bearing on why the Schiaparelli's IMU and altitude sensitive abilities basically suffered the equivalent of a nervous breakdown when it responded to atmospheric density that the lander was totally unprepared to meet. This not the first time there has been a serious question about the pressure range of a sensor sent to Mars. For Mars Pathfinder NASA also ordered a Tavis transducer that could measure from 0 to 15 psia (1,034 mbar): Part 10484, Tavis Dash No. 1 – see Figure 10B in Report, Mars Correct - Critique of All NASA Mars Weather Data. It supposedly remained on Earth. however, if for classified reasons, a decision was made to send it in place of the 12 mbar transducer, none of the pressure data published by NASA for Pathfinder would be reliable. The final disposition of the 15 psia transducer is not clear at this time. 3.2 HOW THE 510 MBAR AREOID FIGURE WOULD AFFECT PRESSURE AT THE 3.7 KM LEVEL WHERE THE PARACHUTE WAS JETTISONED. The 510 mbar at areoid figure is extrapolated to other altitudes on Table 7 above. Again, if pressure at areoid is really the NASA-advertised 6.1 mbar, then at 3.7 km when the parachute jettoned early the expected pressure would have been about 4.33 mbar. However if the earlier 510 mbar areoid figure based on stratus clouds seen 13 km above aeroid at PathFinder is correct then ExoMars 2016 would have encountered a pressure of about 354.96 mbar at 3.7 km above areoid (or, if the 3.7 km figure refers to above ground level [1.2 km below areoid] then the pressure would have been 404 mbar - see Table 11). 3.3 HOW A 51 MBAR AREOID FIGURE WOULD AFFECT PRESSURE AT THE 3.7 KM LEVEL WHERE THE PARACHUTE WAS JETTISONED. While we believe that 51 mbar is too low to explain the weather seen on Mars, for the record a 51 mbar at areoid figure is extrapolated to other altitudes on Table 10 below. Again, if pressure at areoid is really the NASA-advertised 6.1 mbar, then at 3.7 km when the parachute jettoned early the expected pressure would have been about 4.33 mbar. However if the earlier 51 mbar areoid figure based on confusion discussed in conjunction with an initial false methane detection by MSL is correct then ExoMars 2016 would have encountered a pressure of about 36.2 mbar (or, if the 3.7 km figure refers to above ground level [1.2 km below areoid] then the pressure would have been 40.46 mbar - see Table 11). HOW CHANGES IN ASSUMPTIONS ABOUT PRESSURE AT AREOID WOULD AFFECT PRESSURES WHERE THE EXOMARS 2016 PARACHUTE WAS JETTISONED. 4. EXACTLY WHERE DID EXOMARS 2016 CRASH? The probe entered the Martian atmosphere at 15:42 GMT (10:42 ET) on 19 October for its 6-minute descent to the surface, but contact was lost shortly before expected touchdown. The features imaged by MRO are located at 353.79° East, 2.07° South. NASA Spaceflight.com incorrectly states that the dark mark (impact point) is approximately 5.4 km west of Schiaparelli’s intended landing point – well within what was called the nominal 100 x 15 km landing ellipse (see Figure 1B above). The orginal target was 6° West (354° East) and 2° South. Using their own Martian distance calculator with target data of latitude -2.0 (South), longitude 354 (West) an impact data of latitude -2.07 (South) and 353.79 (West) the actual distance is 13.1 km (see Figure 1, subfigure C above). (1) Planetographic latitude with West longitude. This is the coordinate system originally used in the Gazetteer of Planetary Nomenclature, and the system used for maps produced before approximately 2002. An ellipsoidal equatorial radius of 3,396.0 km and polar radius of 3,376.8 km are assumed. (2) Planetocentric latitude with East longitude. This is the coordinate system used for maps produced after approximately 2002, although the planetographic latitudes and west longitudes are also shown on printed maps for reference, and the radii on which these are based are different (3,396.19 and 3,376.20 km). It appears that before it malfunctioned Schiaparelli was making a somewhat flawed approach to its target that was almost identicaL to that of Opportunity before it malfunctioned, but how far off course was the impact site from the coordinates announced before? Above we noted a (miscalcutated) 5.4 km error according to NASA Spaceflight.com. Their calculator indicates the figure should be about 13.1 km. Which os right? For a ballpark estimate, on Mars one degree of latitude difference = about 59 km. The latitude of 2.07° South is only about 4.13 km south of the intended site. However the longitude of 6.21° West (353.79° East), if it were at the equator, would be about 11.97 km off from 6° West. At 2.07° South this error will be slightly less, but on a flat surface with an ordinate of about 4 km and an abscissa of about 11.9 km, the hypotenuse would be about 12.4 km. This is much closer to the NASA calculator amount (see Figure 4 below) than to the NASA article estimate. This correct distance error of 13.1 km compares well with downrange landings of 14.9 km (Opportunity), 13.4 km (Spirit), 21 km (Phoenix) and 27 km (Pathfinder). To know whether it was coming in long or short we need to know the direction of flight. On October 27, 2017 Spaceflight.com wrote that "ESA officials said they also identified the front half of Schiaparelli’s heat shield around 0.8 miles (1.4 kilometers) east of the main impact site. It fell to the surface after ejecting from the lander as designed about four minutes into the six-minute descent." That seems to suggest that the lander was coming in from the east and that if it hit west of the target, it was long (down range) again. GIF Below: Impact of the Schiaparelli lander in 2016. 5. A RECOMMENDED ALTERNATIVE APPROACH TO MEASURING AIR PRESSURE ON MARS. Before going any further in this paragraph it must be emphasized that it is written by Barry Roffman, not David Roffman. It's my belief that the world has been misled by NASA with respect to Martian air pressure. There are two possible reasons for this problem. One is human error, the other is deliberate disinformation. If human error is the cause then I hope that all nations seeking to send people to Mars will benefit by the evidence we've presented to show that air pressure is much higher than NASA asserts. Obviously we hope that NASA will use our finding to get the Americans there first. But NASA has stonewalled taking people for decades. Thus we believe that only way get NASA moving is to help provoke a new space race by putting our data out to the public. We believe that the ExoMars 2016 would likely have succeeded if ESA engineers had based their plans on our data (which they were somewhat aware of before the crash and certainly aware of after it) rather than on flawed NASA data. At a minimum, we believe that priority should have been given to altitude data that was radar-derived rather than (false) heights suggested by the Inertial Measurement Unit (IMU). But what, exactly, do we believe Martian air pressure is at areoid? The 510 mbar/hPa pressure given above was only based on the observation of stratus clouds 16 km above Mars Pathfinder/12.318 km above areoid. We need more data to be sure. However because of the possibility that wrong NASA data is deliberate disinformtation, assessment of how to best measure pressures must also include security issues with respect to the launch vehicle, design of instrumentation and receipt of and analysis of data from Mars. Let's first begin with the assumption that NASA errors are innocent. Design of the Tavis and Vaisala pressure transducers for Viking 1, Viking 2, Mars Pathfinder, Phoenix and MSL were flawed in that all had tiny dust filters which were likely to clog with dust at the instant these craft landed. Further, for Phoenix and MSL, the Vaisala designer, Henriq Henriq Kahanpää of the Finnish Meteorological Institute was not given critical information about the location of heat sources because NASA was more concerned about International Traffic and Arms Regulations (ITAR) than about getting the pressure right. In-other-words, they hired a foreigner to build the sensor, but didn't trust him because he was a foreigner. How can we get around the issue of clogging dust filters? Do away with sole reliance on transducers. Replace them with what? Video with sound, or something like an ultrasound echo transduce. What follows below is an e-mail question and answer with the question going from me to Dr. Thomas Brennan at Ferris State University in Michigan that I sent to him while reading his book (Understanding Sonoluminescene, 2016). QUESTION BY BARRY: In chapter 3 you wrote that, "A sound field amounts to a spatially and temporally varying fluctuation of pressure, P(x, t), with units of pascals in SI." Of course, the units of air pressure that I have been working with on Mars are pascals. Since the pressure sensors sent there are flawed in design, the question is how can we get a better idea of what the real pressure is there other than simply designing a better sensor that does not clog with dust on landing? Might we use sound in conjunction with video? Specifically, we often film dust devils there. Would not a video with sound allow us to not only see a dust devil, but hear them too. Between the lag in time for sound to arrive as well as the strength of the sound heard, we should be able to get a good indication of air density. ANSWER BY TOM: Yes, measuring the speed of sound would be an excellent way to prove the atmosphere is denser than they're saying it is. Looking at my equation 3.7, the speed of sound is related to the ideal gas constant R. I believe that the ideal gas constant on Mars may be different than on Earth, and directly measuring the speed of sound will allow you to measure R, (along with measuring temp T, and the average molar mass of the Martian atmosphere...should we assume it's 99% CO2 like they tell us it is?). If R is different on Mars than on Earth (I believe it might differ by a large factor, between 1/5 to 1/10 of what it is on Earth), then the deduction of the density based on the ideal gas law, P= density * R * T, would corresponding be off by the same factor. I recommended that he should contact the Thales-Alena Space-Italy Group. Note: I left out some comments above by Dr. Brennan about the reason for NASA errors. He concurs with us about these errors, but I think that his beliefs about their cause would best be conferred directly by him to NASA, ESA, or SpaceX should he care to do so. 6. DARKER CONCERNS. And what of the darker concern? I don't want to put too much emphasis on this because it's all too easy to slip into speculation and thus cheapen the value of the data that we have, but briefly I live in an ocean-front condominium in Cape Canaveral, Florida. A good number of my neighbors work at the Kennedy Space Center or Canaveral Air Force Station. There are several units in our condo that at owned by Elon Musk, the owner of SpaceX. Hours before the second successful landing here of SpaceX on July 17, 2017 which I personally witnessed, I spoke with a top SpaceX director who was at our pool. After explaining the MarsCorrect research data, I warned him that if the NASA data was not due to human error, SpaceX would need to pay serious attention to mission security. A few months later on September 1, 2016 a SpaceX Falcon 9 blew up on the launch pad here. Things went wrong as SpaceX fueled the 230-foot Falcon 9 during a practice countdown, part of preparations for a planned September 3 launch of a communications satellite for Israeli company Spacecom. On September 30, 2016 The Washington Post published an article entitled Implication of sabotage adds intrigue to SpaceX investigation. In it they point out Musk's concern about images from video that appeared to show an odd shadow, then a white spot on the roof of a nearby building leased by United Launch Alliance (ULA), a joint venture between Lockheed Martin and Boeing. There was also a noise just before the explosion that some people think might have been a gunshot. Further, Musk's request for access to the roof of the ULA building (about a mile from the explosion) was denied. My friends who work at SpaceX are not supposed to talk about what happened, but they point out a fierce and bitter rivalry with ULA that is in part due to the fact that SpaceX can launch vehicles into orbit for a far lower price than ULA can. As such, Reuters reports that ULA was due to layoff 875 workers by the end of 2017. That alone could provide motivation for a vicious act. There were other concerns about the September 1, 2016 explosion. It carried an Israeli satellite that could have inspired an attack by hostile agents from the Middle East. But, if there was a sniper on the ULA roof, it should be noted that nobody is permitted to be closer than 3 miles to a rocket being fueled. Here the distance was only about 1 mile. Somebody had to have access that would normally not have been granted. When I warned the SpaceX official about a possible attack I didn't know about the great rivalry (I hear hatred) between SpaceX and ULA. Nor did I know about the planned $250,000,000 Israeli Amos satellite that would be lost. My concern was simply based on the fact that Musk created SpaceX for one reason only - getting to Mars (possibly by as early as 2022). I was (and am) concerned that if NASA is keeping people from Mars, and possibly falsifying data about the Red Planet, then they might be trying to hide something vital enough to destroy SpaceX and/or any manned Mars mission. I discuss these concerns in the Afterword of our Basic Report. It's noteworthy that as of 2017 no other nation has yet successfully landed a functioning spacecraft on Mars. How can NASA remove any cloud of suspicion that we cast on their reputation? Publically acknowledge that they read this site and our other sites on a near daily basis, and explain why they do so. Better, acknowledge that they know their weather data is as flawed as we prove it is in our Basic Report. That's enough about my concerns. The rest of this article will return to my son's evaluation of the Mars Phoenix mission and EDL issues raised in conjunction with it. 7. CHECKING NASA'S PHOENIX MATH. This section is written by David Roffman. There were several problems with the math offered by NASA for the EDL. One is that there are different diameters offered online for the parachute, another is that the HIRISE photo seems to suggest en even lower diameter, and finally there is the issue of the late parachute deployment. “Another important aspect to the atmospheric density is in what altitude region is the density lower. The most important altitude band for entry and descent is between 20-50 km, prior to the parachute being deployed. That is where almost all of the deceleration occurs (~90% of the velocity is reduced), and therefore the downrange distance traveled. Above and below this altitude band, the downrange distance traveled is minimally affected by mis-prediction of density”... “Also, the density just doesn’t disappear in the entire column of air (actually CO2). “If the density is lower in this mid-altitude band, then the density is higher at lower altitudes 0-20 km. Basically, more of the column of CO2 moves lower (the CO2 just doesn’t disappear). As such, a little of the effect of the lower density at higher altitude is made up by the higher density at lower altitudes, although far from all." So which is it, a bottom concern of 20 km - prior to parachute deployment, or the published bottom of 10 km - after parachute deployment? I will return to this issue later, but first let's examine how descent velocities change if the diameter of the parachute is reduced from 11.882 m down to 10m. When the entering argument was a surface air density ρ0 of .02 kg/m3, I found that at the end of the simulation, where the altitude was 925 m, the velocity was -53.605 m/s. However, If the surface air density is increased by a factor of 10, the velocity at the point where the smaller parachute is ditched is increase from -16.6733 m/s to -19.8343 m/s. 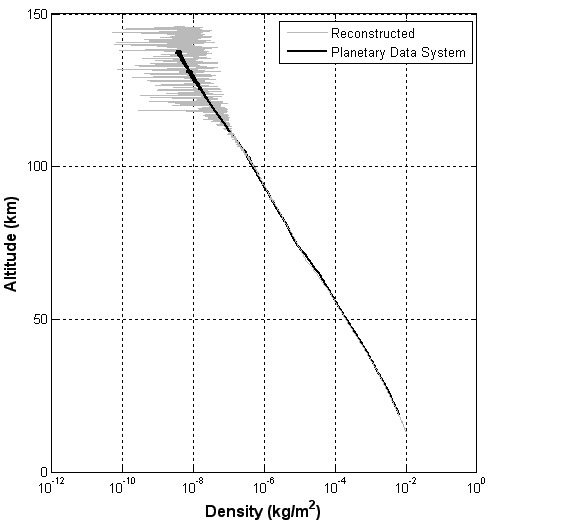 7.2 WRONG ASSUMPTION ABOUT DUST CONTENT AND DENSITY: The article by Braun and Manning (Mars Exploration Entry, Descent and Landing Challenges) states, "Atmospheric variability across a Martian year limits our ability to develop a common EDL system. In addition, significant atmospheric dust (a random occurrence) increases the temperature, reducing density and requiring conservatism in the selection of landing site elevation. I strongly disagree with their conclusion. J. D. Parsons addresses the compressibility of dust storms and positive feedback for their formation (Are fast-growing Martian dust storms compressible?, Geophysical Research Letters, August 1, 2001). Pre-dust storm density values are around 9.4 g/m3. A sample dust storm given in Parsons paper would have additional densities of 17g/m3 in order to even be created. This is an order of magnitude greater than terrestrial storms. It also constitutes an increase of at least several hundred percent over previously accepted values. In the Sahara, pressures have been observed to increase during dust storms. Likewise, on July 5 2011, a huge dust storm hit Phoenix, Arizona. At nearby Luke Air Force Base in Glendale, pressure rose by 6.6 mbar (more than accepted average pressure at Mars areoid) between the storm’s arrival at 0255 Z (pressure 1004.7 mbar) and 0555 Z when the pressure was up to 1011.3 mbar. Pressure dropped as visibility cleared at 0655 Z (personal phone to Luke AFB meteorology, July 6, 2011). 7.3 MORE DENSITY CONCERNS ARISING FROM MATLAB CALCULATIONS. After noticing a problem with my aero-shell density profile I went back to just to get the densities. A more accurate model using scale height and temperature profiles yielded an odd answer. Using the given 56 km high air density (10-4 kg/m3) provided in the Dutta et al. paper I arrived at a surface pressure of 23-24 mb. This is answer was obtained by using the official numbers. The density was computed at each data point using the baseline density as that at the previous data point. This increases accuracy. I neglected the contribution of any atmosphere above 56 km to surface pressure because it should be negligible. If this answer is correct, then the higher air pressure is 3-4 higher than expected by NASA/JPL. This difference, however, would help explain the missing landers though. NASA cites a figure where surface pressure is 20 mb from the 1969 Mariner mission at http://history.nasa.gov/SP-4212/ch8.html . 1. Define starting parameters: density at 56 km, gravity, mass of CO2, and starting height parameters. Chose the step size for the simulation to advance (I choose 10 m). A smaller step size will only change the answer by about 0.01 mb. Note that z and z0 are used in combination to keep track of height and densities. All units are SI units. Define an empty vector that will keep track of the contribution to pressure at each data point. 2. Run “while” loops to iteratively solve for density. The empty pressure vector (P) is being appending during this time. 3. After all the loops have run the computer displays the surface pressure in mb (which is not SI). The variable rho stores the surface air density (obviously at the end this will equal rho0). The temperature at the end was about 223K which is in between the 200 and 240 K measured at the Phoenix lander. See the MATLAB code below. %difference used in the calculation. z0 = z0 - dz; %Set the lower bound of altitude as current minus dz. FIGURE 7: Change in density vs. altitude for Phoenix. PROBLEM: The parachute deployed 6.6 seconds late. The next invesitgation will examine the issue of whether 10 to 100 times more water vapor in the atmosphere than expected accounts for this delay via increased buoyancy in the atmosphere. I first calculate an estimate of the velocity profile from 13 to 50 km of the Phoenix lander (later I will focus on the 13 to 40 km fragment which I believe will most closely explain the 6.6 second delay). Where the density ρ is given by: ρ = ρ0*exp(-z/H). The surface air density ρ0 is .02 kg/m3. Since “H” is a function of temperature, a temperature profile was used. “A” is the cross-section of the space craft, which is 5.47 m2. The angle is the initial entry angle and is assumed constant (13.3 degrees). 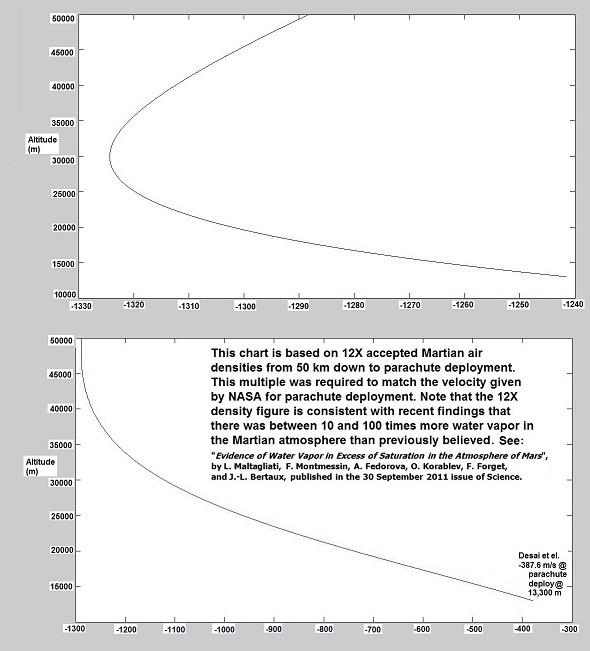 The Martian gravity “g” is 3.711 m/s2 and the initial altitude and velocity were 50 km and 1180 m/s (downward component) respectively. As for the total velocity, it is 5450 m/s, which was taken from a paper by Withers and Catling (2010). The lander mass “m” was 582 kg. This problem was broken into two ODE’s (Ordinary Differential Equations) and solved as initial value problems with error in the second order (I used a time step of .0005 s to attempt to compensate). The first run assumed the density at 56 km was the given 10^-4 kg/m3 (see Figure 7). When run like this, the downward velocity at 13.3 km altitude was 448 m/s and it took 44.03s to transverse this distance. However, using this offical figures yielded a surface pressure of 23-24 mb. The next test asked what density at an altitude of 56 km causes the surface pressure to be ~8-9 mb. When run like this, the downward velocity at 13.3 km altitude was 880 m/s and it took 37.22s to transverse this distance. This velocity is not the ~387 m/s measured on the craft, but it does account for the ~6.6 s. Note the code below can be altered by changing rho0 before the loops. While it appears the code works, it may be changed later if I find bugs. This code assumes the only acting forces are weight and drag. It does not account for the change in mass from the lander shedding parts, nor the change in the parachute and lander cross sections as the angle of interaction betwen the lander and atmosphere changes, nor the buoyancy force at high altitude and the idea that it may be unexpectively high at low altitude if the density is enough to allow for a pressure at areiod as high as 510 mb. The Phoenix code does not include the force exerted by the engines, however on ExoMars 2016 the engines appear to have fired for only 4 of 29 planned seconds. Without the EDL data which encompasses the position and velocity as a function of time and a more detailed model which addresses the concerns in the previous sentence, it is impossible to predict the atmospheric density from this crash. Once again, to my friends at ESA (and by extension Roscosmos) I need access to all the data you received during the landing to accurately begin to answer all the questions that are implied by your frequent visits to my site, and in particular to this article as it is being developed. NOTE: FIGURES 8 AND 9 ARE STILL UNCERTAIN! MORE VELOCITY DATA IS NEEDED. FIGURE 10: Phoenix EDL Overview. LIMITATIONS OF THE ABOVE PHOENIX CALCULATION. It should be noted that this is a rather simplistic model. There is no inclusion of the small buoyancy term, I do not have access to the drag coefficient, nor a more detailed geometry of the lander. The geometry matters as the effective cross section of the craft could change if a torque exerted on the craft causes it to change its entry angle. The purpose of updating this article is to indicate that changing the surface density by an order of magnitude (all other things equal) can cause a significant change in the final velocity of the craft. In the context of the EXO-Mars mission failure, the team responsible for collecting the EDL data should change the base air density assumed in their model to make sure that the model matches the measured EDL data. This will provide a baseline for the actual surface air density. To get a more precise answer it may be best to design another mission that has the purpose of collecting atmospheric data while falling, with no intention of actually landing. Then use that information to plan for a future landing. Working notes: The following factors will be included in reference to parachute calculations as this article develops further.